"Dark Matter" Season 2 premieres on Syfy July 1 at 10 p.m. EDT (9 p.m. CDT). Syfy's complex space mystery "Dark Matter" returns for Season 2 tonight (July 1), and it promises more enemies, bigger fights and shocking deaths. 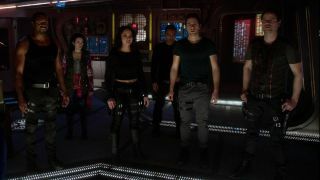 At the beginning of the show's first season, six unnamed characters (and an android) wake up on a ship with no memories of how they got there. Throughout the first season, the uneasy crew members try to survive and figure out their place in a dangerous universe. In Season 2, the crew will take on a more active — and more dangerous — role, the show's creators say. "It's going to be really interesting to see the fan response — that's all I'm going to say," he added. On other Season 2 topics, though, Mallozzi was willing to open up a bit more. "Season 1 was very much micro," he said. "We keep it on the character level — they're finding out about themselves, and [it's] very ship-centric," he said. "[In] Season 2, we're going to be going out more; we're going to be finding out more about the universe, colonized space, more about the corporations and the fact that it would seem that we're headed for a corporate war." They'll be more proactive and take the fight out to the enemies they've established over time, he added. Although the mystery drove the plot forward in Season 1, the characters and their relationships with each other played a large part in tying everything together and keeping viewers interested. All of the cast members discussed that aspect during the press visit, but Zoie Palmer, who plays the android, put it particularly well. "Right from the get-go, I've thought about [the show] as when you get into an elevator with people and you'd rather do anything but look at each other — until it stops between floors," Palmer said. "And then, you're immediately the closest friends … They're the only people in the world to you, right? And I think that's this group of people." "They wake up, and it's all just mistrust, mistrust, mistrust," she added. "And they realize … we're in hell, we need each other, we desperately need each other. And so it's just sheer survival." And while the story's twists, turns and revelations may look chaotic from the outside, there's a broader strategy at play. "I do have a plan, a five-year plan — I know where each year will end," Mallozzi said. "You're on a journey with them for these five years, this journey of redemption — and it's not going to be a happy ending for everyone, is all I'm going to say. Like in real life." Watch "Dark Matter" Season 2 return tonight (July 1) at 10 p.m. EDT (9 p.m. CDT) on Syfy.